Hello! Today I've got a unique product review to share with you! 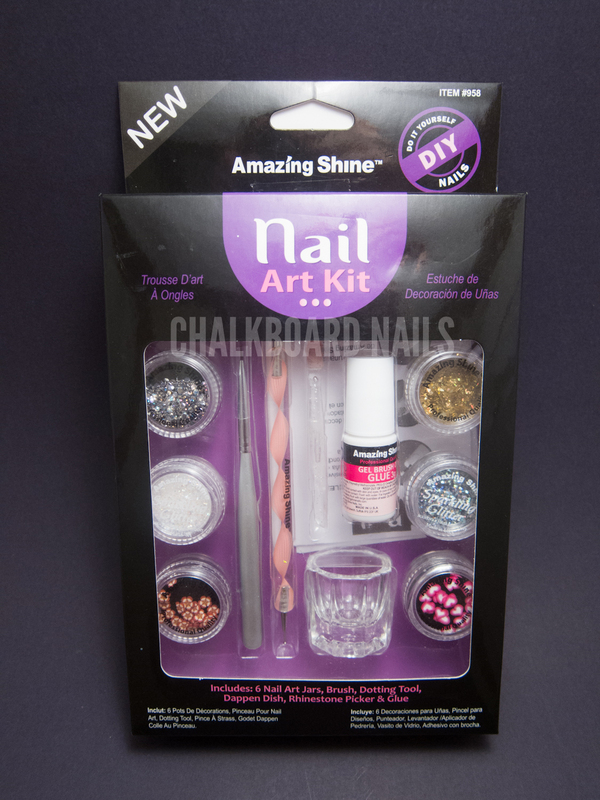 We're gonna be taking a look at the Amazing Shine Nail Art Kit -- a kit that includes a number of different tools and 3D nail art supplies. Read on for a breakdown of all of the items, tests of the different components, and my overall thoughts. First we have the kit itself! All of the items come seated in a plastic tray in a box. Here are the glitter, rhinestone, and fimo pots that come with the kit. There are two jars of glitter (a white and a darker/iridescent blend), one jar of round rhinestones, one jar of gold shard flakes, and two jars of fimo (flowers and hearts). The kit calls the fimo slices "gimo," but you may know them as fimo like I do. 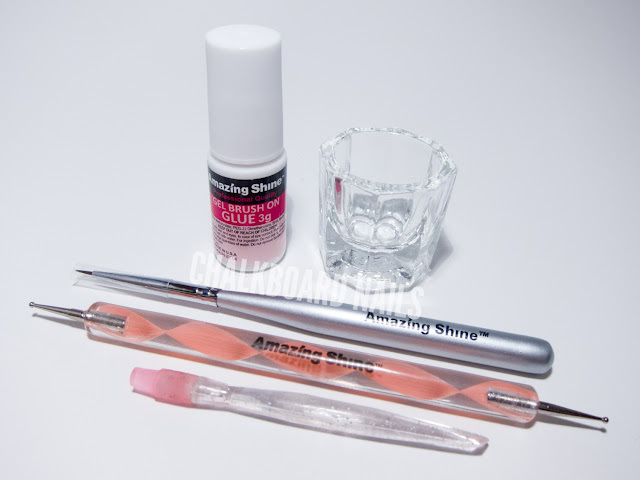 Besides the jars of 3D nail art supplies, the kit also comes with nail art glue, a small glass dappen dish, a fine point nail art brush, a dual ended dotting tool, and a rhinestone picker. The dappen dish is nice! It's heavy and sturdy. I would most likely use this to hold acetone to clean my brushes while I do nail art. The instructions in the kit also suggest that you can use it for watermarbling, which is ingenious. You'd only be able to fit one nail at a time, but you wouldn't have to make your marbling bullseye so big! The nail glue in this kit is serious business. Once it dries, it holds on like you wouldn't believe. Be very careful when using it! You don't want to get it under your nails or pooled in your cuticles. It is challenging to remove, so make sure you have acetone handy when you go to take your manicure off. If you take a look at the photo below, you can see the relative sizes of the tools. The brush is a small detail brush. 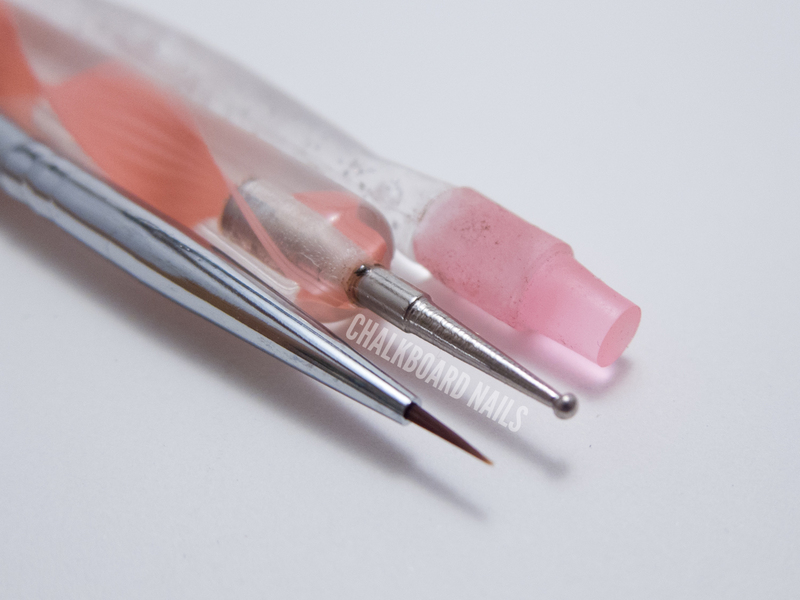 It's shorter than the brush that I normally use for my nail art but still offers good control when doing fine lines or other detail work. I think it's definitely a nice starter brush for someone who is just getting into nail art. The dotter is the same size on both ends (small). I think this is a missed opportunity to include a dual ended dotter with a different size on each end. If I had to pick just one size to include, though, this would be it. I have never heard of a rhinestone picker before, and was excited to try it! Unfortunately I think it's just a bit too big for precision placement. I had an easier time wetting the end of the dotting tool and picking the rhinestones/flakes with that. While the rhinestone picker didn't work for picking rhinestones, it could be cool to use it as a circular stamp! 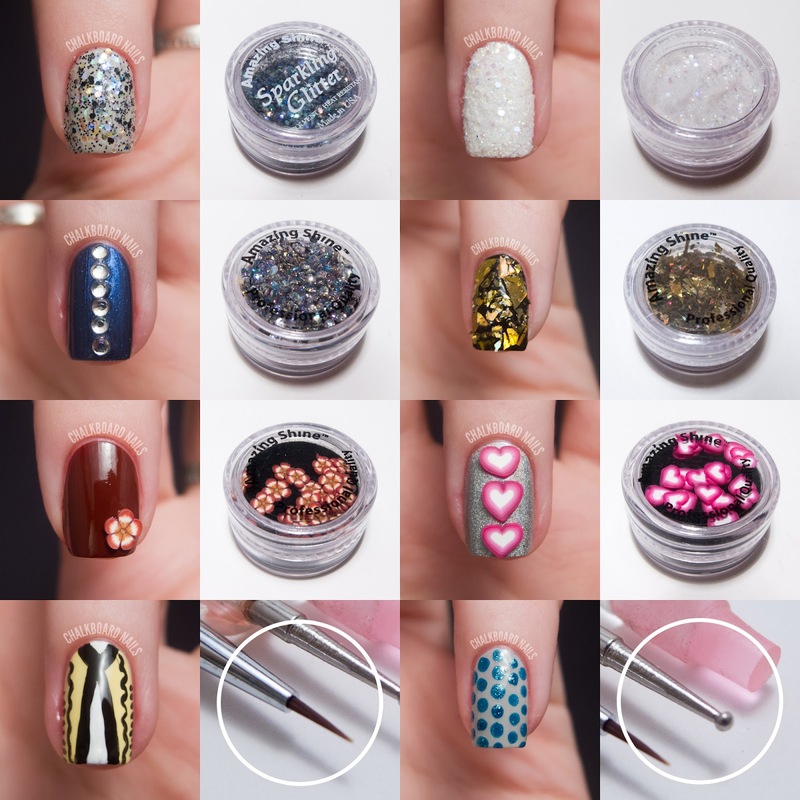 Here are some looks that I created using the nail art items. On the pointer, I have layered the loose dark/iridescent glitter over OPI Skull and Glossbones. For this nail, I attached the glitter by sprinkling it over the wet polish. On the middle, I have covered white polish with the white glitter, making it look like shimmery snow. For the application of this one, I used the nail art glue and dunked my nail into the pot. 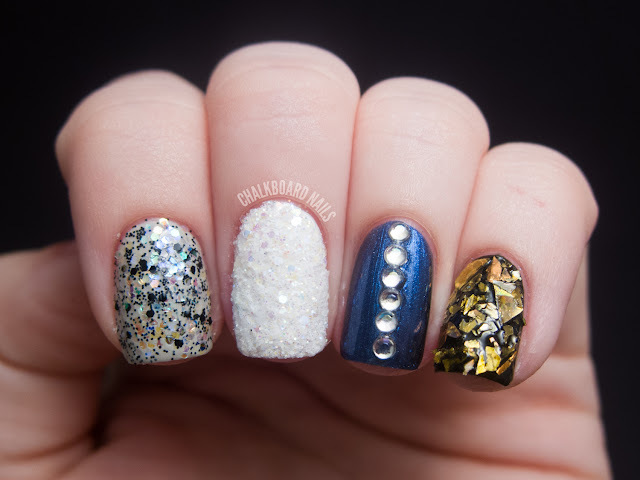 On my ring finger, you'll see a line of the round rhinestones over OPI Into the Night. I used the nail art glue to secure them. On my pinky, I placed gold shard pieces over black. Again, for this one I used the glue and then attached the pieces individually. On the pointer, I attached the flower fimo slice with nail art glue. The base color is China Glaze Brownstone. 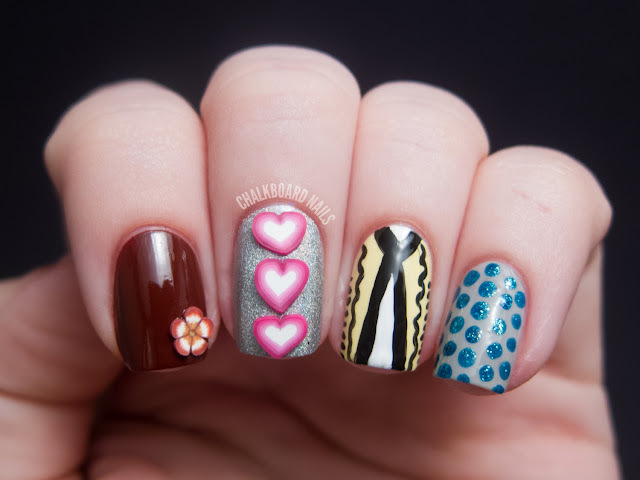 On the middle, three heart fimo slices have been attached over Color Club Worth the Risque. On my ring finger, I've done some random nail art with black and white over Finger Paints Lemon Sour to demonstrate how the brush works. You can see that it does well with fine points and detail work. On my pinky, I used the dotting tool to make dots with Zoya Charla over Zoya Dove. Here is a breakdown of all of the components and the nails that go with them. Overall, I think that this is a good kit for a person just starting out in nail art who wants to see if 3D nail art is for them. It includes a lot of varied components and tools that would allow someone to test the waters. I like the fact that these items can be combined with polishes you already own to create a number of different looks. This product was provided to me by the manufacturer or their PR for review. Looks like a good kit for the basics! Do you think there is a good amount of glitter, rhinestones, fimo, etc. in each pot? Sometimes I think there's a lot of good stuff in there and then am disappointed upon opening the packaging. Hi Marge! There are good amounts of the glitters and the gold shard flakes. The rhinestones and the fimo containers are padded below the actual "items," so there is a smaller amount in those. I think with those pieces though, a little bit goes a long way. I think my photos accurately represent the amounts in the packaging. For clarity, in the picture of the rhinestone pot, that is the only layer of stones. Thanks, Sarah! I think I'll order the kit! I really like the white glitter and gold shards :) I'm not typically a fimo gal but I know some ladies whose nails I do would love the flowers. Thanks for the review. I might get this, it looks great! Great job Sarah! I love the fimo hearts!! This is really great. I love it, you did an amazing job! Seems like a great kit! Love the looks you created! Awesome job Sarah! Love all the looks you created! Looks like a really good starter kit for a great price, I wish it was in stores! I agree! Maybe if they do well enough online, Walgreens will put the product in their stores. I love the one with the gold shards, very pretty!! What a lovely idea. I've often thought about putting together sets like this as gifts. This contains a perfect mix of things for people to try out lots of different looks and techniques. I love all the looks you created by the way :) The fimo heart one is especially cute. Darn it! There are no Walgreens in Canada!! I so want this! What a funny kit! I love all the things you've done to share with us! Thanks! Wow, that kit is amazing, love what you done with your nails! I can not chose a favorite one, because all of them are great! this is such an awesome product/kit and your nials look fabulous! This kit looks awesome! I need to go buy one (or two!). the snow look you did in that first set is killer! Yeah that rhinestone picker has a giant head! Sally's sells one with a MUCH smaller head and it is awesome. Well, it's double ended, but the small side is the perfect size! I have a picture of it side by side with a dotting tool on my blog if you want to check it out (the post from June 7th). It's a great tool! And I think it was only $4! Do they still sell these at walgreens? Unfortunately I don't know. :( Sorry! yeah i know, but when i opened the top, there was a plastic thing. The plastic should just lift off, straight up, I believe. this product is no longer available on the walgreens site. where else can i find it? I'm sorry, I don't know. I would try looking for the manufacturer and asking them.